Family structure, intergenerational mobility, and the reproduction of poverty: Evidence for increasing polarization? A substantial body of research has demonstrated links between poverty and family structure from one generation to the next, but has left open key questions about the implications of these associations for aggregate-level change. To what extent does intergenerational inheritance affect trends in poverty and single parenthood over time and, in particular, trends in the relative economic positions of single-parent and two-parent families? 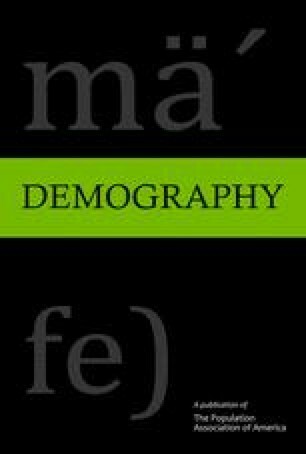 This article examines how patterns of intergenerational inheritance play out in the population over the long run, using data from the National Longitudinal Surveys and a model of population renewal that takes into account intergenerational mobility and differential fertility across groups that are defined by poverty status and family structure. Our results suggest that current rates of intergenerational inheritance have little effect on population change over time. They account for only a small share of the recent historical change in poverty and family structure and play no role in exacerbating existing economic disparities by family structure. This research was supported by Grant K01 HD42690 from the National Institute of Child Health and Human Development and the Office of Behavioral and Social Sciences Research, by the Council on Research of UCLA, and by the John D. and Catherine T. MacArthur Foundation. It made use of the facilities of the California Center for Population Research, which is supported by the National Institute of Child Health and Human Development. We thank the participants in the Demography Workshop at the University of Chicago and the CDE 40th Anniversary Symposium at the University of Wisconsin-Madison for their helpful feedback on earlier drafts. We are grateful to Cameron Campbell, Daniel Lichter, Judith Seltzer, and three anonymous reviewers for their many useful suggestions and to Stephanie Nawyn for her expert research assistance.